if use table top level, drag container is under table, it does not work, how to make it work like the following html structure ? thanks lot. .here add drag and drop table row ..
… and your second question. You can block dropping DIV element to some table with droppedBefore(targetCell) method (input parameter is target cell). So, the trick is to climb from TD to TABLE in DOM (please see REDIPS.drag.findParent()) and if found table is not allowed, just return “false” from droppedBefore() event handler and DIV element will return to the source position. Hope this tip will be helpful for your case. Actually, this example is not so shiny because “message” reference is set on each move event. Better approach is to set element reference once outside the handler. @John – REDIPS.drag lib is designed to allow nested tables. Please see example 13 – Nested tables with simple DIV elements (darker cells are more deep). Example 19: Groups and table rows shows how TR is moved between tables nested one level deeper. Hope this examples will give you some directions how to resolve your issues. How you can drag & drop from one table to another if the target table has no rows? I also made a double click on the row of source table to “fly” to the empty table, but that is possible only if there is at lest 1 row. Is ti possible to put a row in a empty table? I see that your script is looking for at least 1 row. Is it possible in this case to create one dummy row put the one from the source table and delete the dummy one? If yes, how this could be done? @Vince – If table is empty it should contain “so called” empty row. Please take a look example20 or here in page try to move all rows from first to second table. At the end, table will have one “empty” row that can’t be moved. I think that example20 is a good start point for your project. One question, how to get one Cell of the row which is moved? I need to move rows and I need to identify which row is moved by the first cell…? I found your wonderful script and it has truly been very helpful. I have one problem though. I need to be able to reload the whole table with new values. Once I have done this, I no longer have the drag controls available. I made a jsfiddle (http://jsfiddle.net/betsyjsg/7kykbuac/) example. 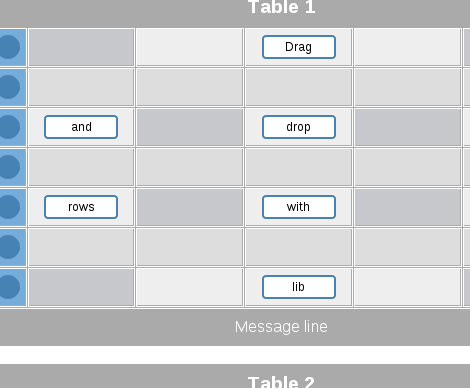 When I run the script initially, the table rows can be moved around without issue. But if I update the table with new values, the drag controls are lost. Is there any way to do this? First of all thank you for creating these libraries. It has been such an amazing learning experience. My question is regarding the drop element. If each of these elements are coming from a mysql database using php, how can I get it to update the mysql database on drop. It would be of great help if you could suggest me some starting point for this. I would really appreciate your input on this. How can i change the ‘drag row’ selector? I use bootstrap, and class ‘row’ is heavily used and can not be used as the drag selector class! I would know if it possible have this structure: and drag and drop rows between tables? Because I have problem to drag and drop in the area not visible initial! I see in you example you move on single table scrollable, is it possible my case? Oh my God, this is the most great work, what i ever seen. Thank you so much, your example01 has solved all my problems, what i had with ugly drag and drop in jQuery UI. Hello I appreciate so much the redips drag n drop and I am trying to apply thatto a project ofmines. Everithing good but a little (big!!!) problem: a row is dragged perfectly until you set the “minwidth” property or if you write some text in a cell of the second column..